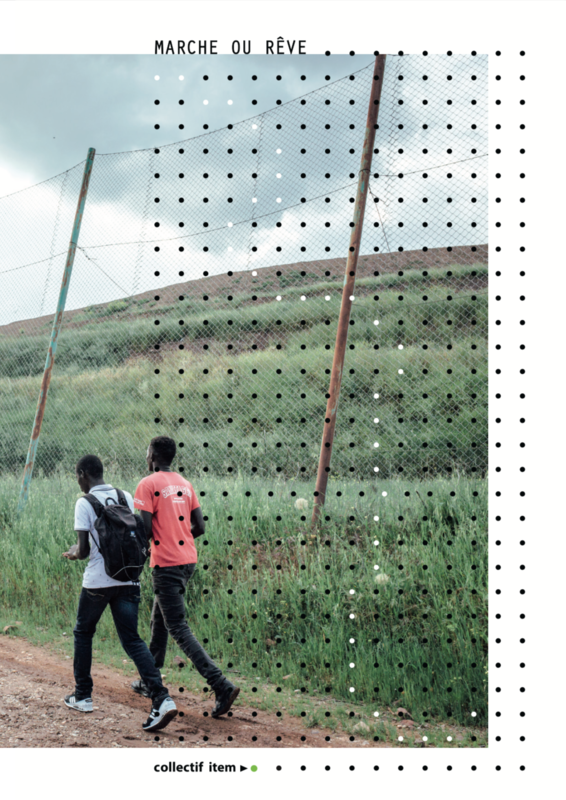 Its rallying slogan, “So as not to stay with our eyes shut”, is a leitmotiv that resonates for humanitarian workers, development professionals and social workers and which justifies our turning the lens towards these revealers that are photographers. 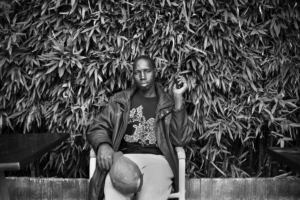 Created in 2001, collectif item’s members now include 12 photographers, a video and sound director, a graphic designer and an anthropologist. By producing documentary images, collectif item broaches social, political and environmental issues. It is an organisation that enables its fifteen members to share resources and skills, but also and above all to evolve in a workspace that gives them the necessary time and resources to build a common reflection. Over the years, it has become a space of emulation, development and resistance, refusing easy answers and fatalities, but especially a space to suggest and to build. Together, the members imagine how to broadcast and follow up on their respective works and collective projects, beyond press coverage, particularly for the benefit of audiences far removed from media sources. They are involved in school mediation and take part in workshops for image education. Six images by six photographers from the collective are published here, to show the diversity of their work and subjects. Tshuapa province, Democratic Republic of Congo, October 2016. Women go to market in a neighbouring village to sell chikwangue (traditional food made of cassava) and other “non-timber products” from their crops or gathered from the forest. 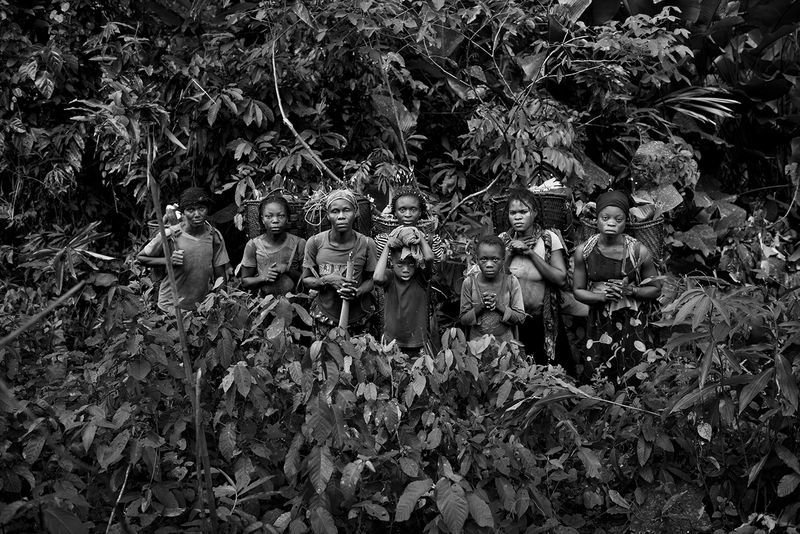 The local populations, who largely depend on the forest for subsistence, seasonally forage for caterpillars and other food or medicinal products. At 7 A.M., a number of Polish women are in the gynecologist’s waiting room. Magda (22 years old) has come with Tomek (21 years old) from Bialystok (Poland), 800  kms from Prenzlau. They journey took 28 hours. For an abortion – illegal in Poland – the doctor asked them for 50,000 PLN (Polish zloty, roughly 11,500 euros), which is 25 times more than Tomek earns every month. He and Madga already have a one year old girl who has been treated several times in the hospital, over which period Tomek was working 20 hours a day and suffering from high blood pressure and sight problems. He borrowed money to bring Magda to the German clinic. Between Clavières (Italy) and Montgenèvre (Hautes-Alpes), March 2018. Moving forwards, whatever happens, and whatever the conditions. Migrants travel through the night and snow to cross the border as discreetly as possible. When they get back on the asphalt road, some are injured when trying to hide on the side of the road as a car goes by. The fear of running into the police, who has increased the size of its patrols, does not stop them. It just makes them take more risks and follow more hazardous paths through the snow. Rather than walking for four hours to reach the town of Briançon, their journey can last more than seven hours. 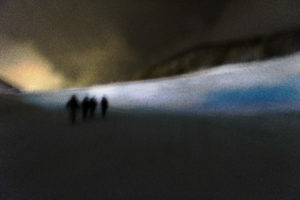 The Alpine route taken by the migrants is particularly dangerous. A significant network of solidarity has sprung up in the Briançonnais to overcome both the harsh winter and the failings of the public authorities. But good will is no longer enough. Mokolo, Far North, Cameroon, August 11th 2017. 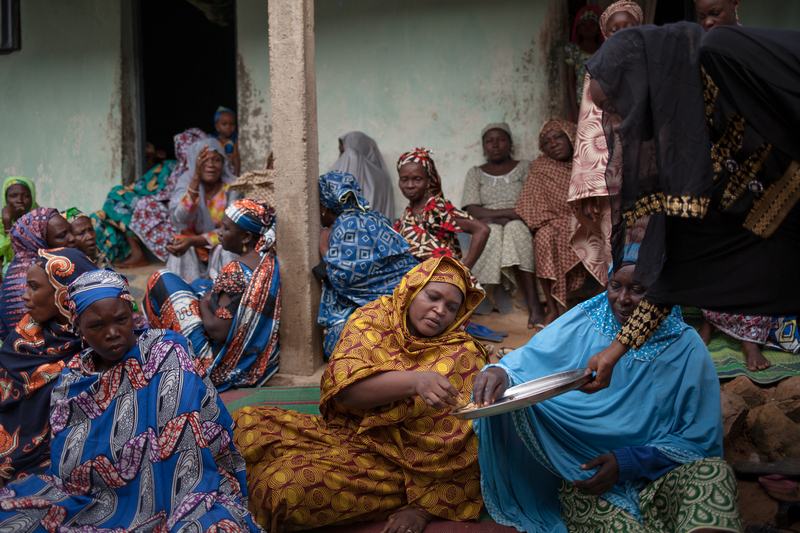 Women gather during a wedding in the capital of the department of Mayo-Tsanaga, 30 kms from the Nigerian border. It was early morning. After an order from the medical NGO ALIMA, I left with the driver, and we came across a crowd sharing a meal to celebrate a wedding. Mokolo has been spared attacks by Boko Haram, which are rife nearby. The inhabitants say it is because of the mountains that surround the town. But access to health care in this region, which had already been abandoned by the Cameroonian State before the Boko Haram insurrection, remains problematic. And with the arrival of Nigerian refugees and displaced people from the area, problems with malnutrition and cholera are on the rise. Many people flock from the surrounding areas to the health centre, where ALIMA is in charge of malnutrition and children under the age of five. Mothers ride for hours on motorbikes to get there, carrying their babies in their arms. Port-Louis (Mauritius), December 4th 2014. “No one does anything for the Chagossians! And what can you do against the Americans? Poverty’s real for us…” Rosemay talks fast and loud, she harangues, laughs, shouts, then looks at you with smiling eyes. Sitting proudly in front of her hut, Rosemay takes care of animating the street. A young pregnant girl sits next to her on the side of the road. She is fourteen. Rosemay is 67. She has seen it all before. 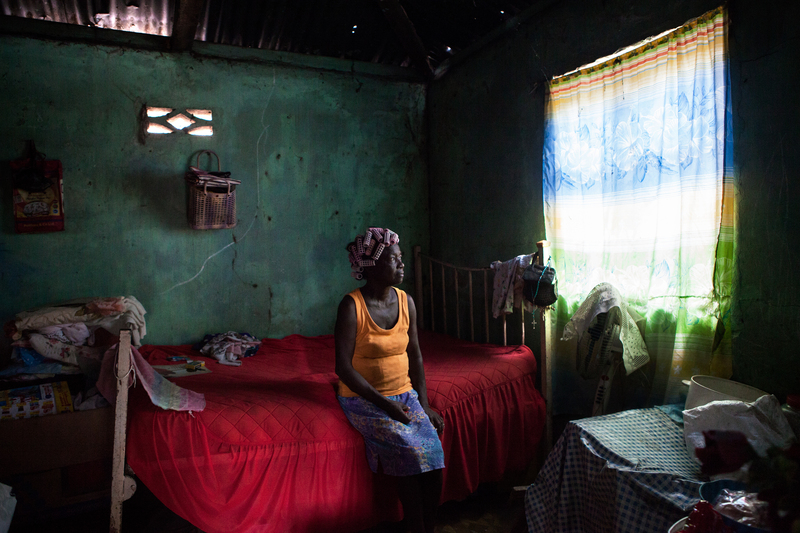 On this plot that she shares with other families, Rosemay lives alone. She leads us into her hut, the roof of which is a heap of metal sheets. The inside has been worn by the inexorable passage of time. Sitting on her bed, Rosemay tells her story: she was born more than 2,000 kms from Port-Louis, in Peros Benhos, in the Chagos archipelago. Like all the other Chagossians, she was deported in the 1960s, when the UK reached an agreement with the US to get their hands on the strategic archipelago. Forcibly resettled in Mauritius, Rosemay married a Mauritian, who since died, and her nostalgia for her native island has not faded: “Over there, it was more beautiful than here, one hundred per cent”. Rosemay lives on her meagre pension. No one helps her. Her children don’t help her. And to hear her talk, Olivier Bancoult [Editor’s note: Chagossian leader fighting for the Chagossians’ right to return to their archipelago] doesn’t help her either: “It’s theft! Everything for him and his family! Nice house, holidays, and what do we get? Poverty! Poverty!”. 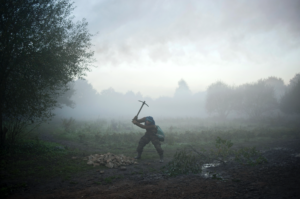 Horseshoe Garden, ZAD at Notre-Dame-des-Landes, October 30th 2012. “Operation Caesar”, intended to unseat the opponents of the airport project at Notre-Dame-des-Landes [near Nantes, France], is underway. 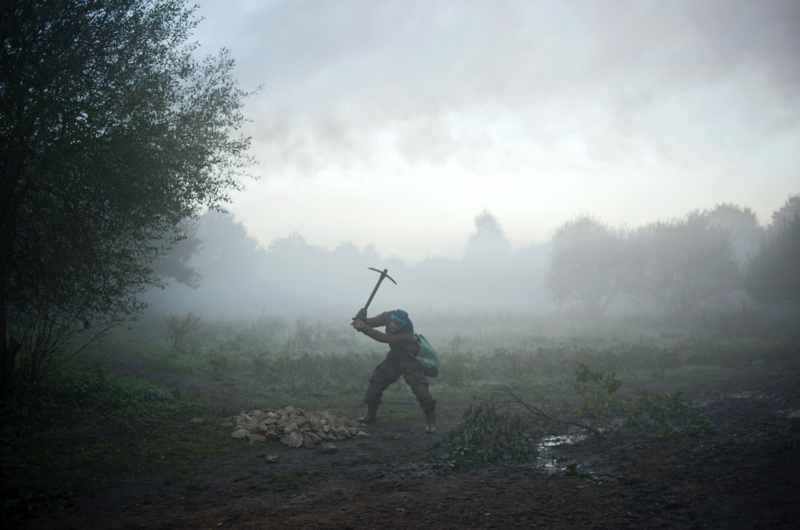 An activist breaks pebbles with a pickaxe to organise the defense of the “Horseshoe Garden”. 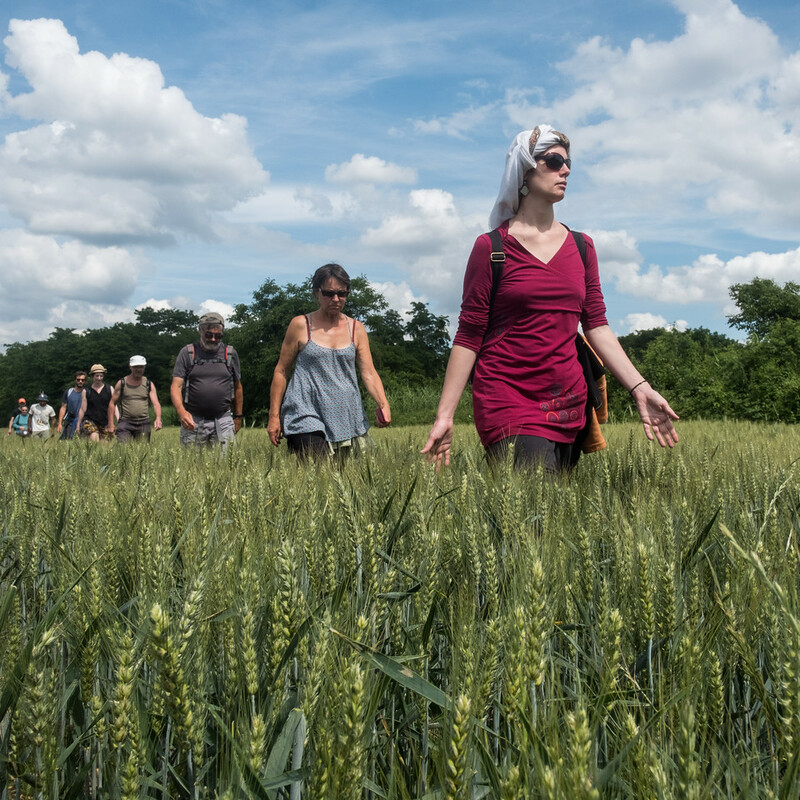 For two years, this garden was collectively cultivated in order to ensure self-sufficiency in food for the ZAD. This symbolic place was the setting for violent clashes between the security forces and the activists. Sprayed with significant amounts of teargas, the garden was eventually abandoned at the end of 2012. In 2018, the collectif item Editions were set up to enable them to get their message across in yet another way, and to extend their playing field. 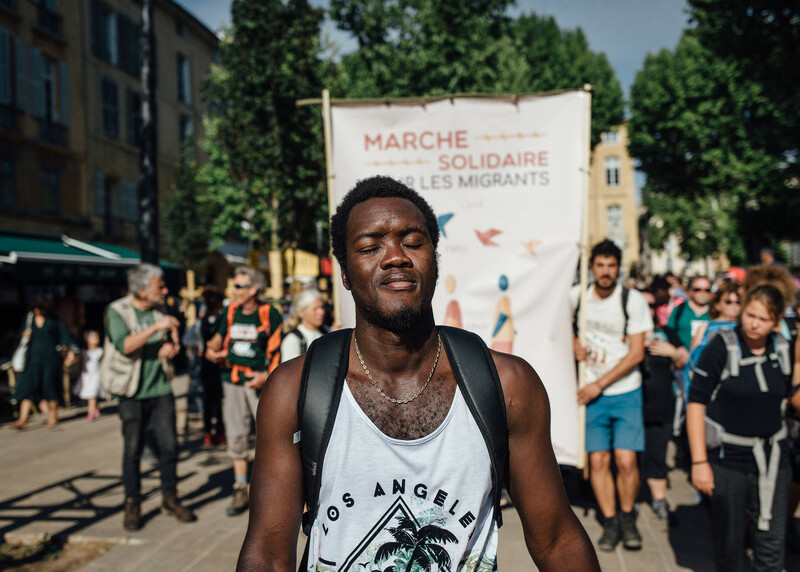 Marche ou rêve was the first collective book, which poetically and politically documented the march for solidarity with migrants which crossed France from the valley of Roya to Calais between April and July 2018. This article’s four closing photographs are taken from this book, which illustrates the capacity of the collectif itemmembers to work together on a project and the way in which they are, individually and photographically, concerned with the subject. A multitude of gazes intermingle, showing that the collective is not merely an aggregate sum of individuals, but an entity in its own right. Together, they embody the fine phrase: “Our task is to open up these blind eyes”(1)Dominique Desanti, Jean Toussaint Desanti et Roger-Pol Droit, La liberté nous aime encore, Odile Jacob, 2004..
Yaya, a Guinean migrant, takes part in the Citizen Solidarity March near Saint-Maximin (Var), May 10th 2018. Stage 43: Évry (Essonne)-Villeneuve-Saint-Georges (Val-de-Marne), June 15th 2018. Demonstrators make their way through a field of wheat. Riwal, demonstrator. Stage: Villefranche-sur-Saône to Belleville (Saône-et-Loire). May 27th 2018. Omar, demonstrator and member of the “sans papier 75” collective, listens to the radio during a pause in a café in the town centre before the festive march between Douai and Lille (Hauts-de-France), June 30th 2018. This entry was posted in Issue N°10 – March 2019, Reportage (VEN) on 25 March 2019 by Alternatives Humanitaires.